As hip-hop has become the most listened-to genre, Drake is perhaps its last true crossover artist: at home in pop and rap, radio and streaming. He will release his latest album, Scorpion, on June 29. From the album trailer for Scorpion, whose moody choice of score can also be heard in the 2018 sci-fi thriller Annihilation, it's clear that hip-hop's golden boy has entered the darkest period of his career. 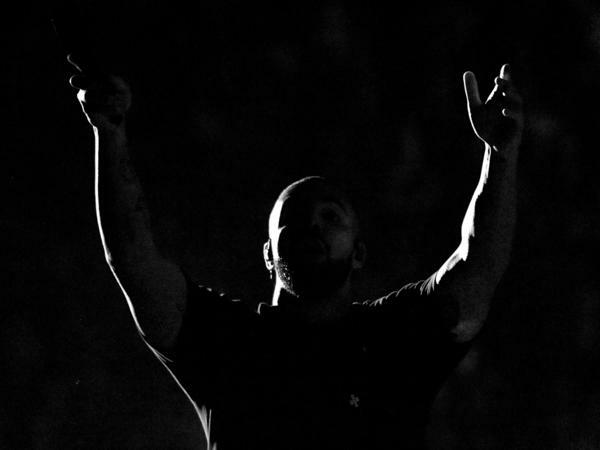 Drake has spent years on top, amassing massive hits and setting unprecedented streaming records. Past challenges to his legitimacy have left him virtually unscathed, but this year is different: The rollout for his latest LP was hijacked in May by a virulent and scandalous dis record from Pusha T ("The Story of Adidon"), alleging Drake has a hidden child. The accusation left the industry emperor naked, his family secrets seemingly on front street and his brand in jeopardy. For the stereotypical rapper, such a revelation might hardly matter. For an artist who has crafted an image of sensitivity in a cesspool of toxic masculinity, such a secret — which Drake has yet to deny — threatens to recast him as a hypocrite. Staying the course has worked in his favor until now, but if Drake truly wants to take his career to the next level, he might try something unprecedented: conceding defeat. In 2018, the most anticipated hip-hop releases have been exercises in self-restraint rather than revelation. Now that rap has scaled up to world dominance, its key players can sometimes seem too big to fail. Increasingly, it isn't what's said, but what's not said that drives the discourse: None of G.O.O.D. Music's recent releases, for instance, have produced more hits than label boss Kanye West did by getting his black card revoked on TMZ this spring. After the public debacle of his comments on slavery, West went out of his way to remake his new album, ye, and in the end still failed to contextualize his words in a meaningful way. Nas stayed mum on ex-wife Kelis' recent allegations of abuse, choosing instead to drop subtle digs at his "exes" on his own G.O.O.D. release, Nasir. More and more, the genre's biggest stars seem increasingly obsessed with protecting their assets on the mic, building fortresses around themselves rather than storming the castle. At age 31, Drake has reached a similar turning point in his career. The question is whether or not he knows how to properly pivot. It seems safe to assume much of Scorpion was complete before the beef with Pusha T stole Drake's thunder — and unlike West, he's too calculated an artist to discard everything he's worked on and record a rush job in response to a scandal. Rather than issue a direct response to "The Story Of Adidon," Drake's next move was a video for his single "I'm Upset," in which he reunites the cast of his Degrassi: The Next Generation past, recreating the fantasy world of his adolescence. This week, rumors emerged that Scorpion, evidently a double album, will confine its rap and R&B tracks to separate discs — a classic move, if true, for a self-styled ladies' man who nonetheless craves the respect of his street-hardened peers. Throughout his career, Drake — a biracial child of divorce who learned to split the difference between a schoolteacher mom of Jewish descent who raised him in Toronto and a black father from Memphis who was distant for most of Drake's childhood while pursuing his own music career — has excelled at playing these divergent roles. And in recent months, as splashy singles "God's Plan" and "Nice For What" have catered to his commercial, female-friendly fanbase, he has also worked to reestablish his street presence through collaborations with newcomers Blocboy JB ("Look Alive") and Lil Baby ("Yes Indeed"). With the style undergoing such a watershed period right now, rap beef feels like a petty distraction. Forty years into its existence, hip-hop has sprung a new fountain of youth via SoundCloud's ongoing expansion of the genre, at an age when rock was already over the hill. On the other end of the spectrum, select lions of the genre have given the middle-aged MC a new viability. Quiet as it's kept, this is also the biggest moment for women in rap in what feels like eons. Meanwhile, some of the best projects of the year have come from underdogs, including independent Chicago native Saba, Top Dawg Entertainment's bedrock MC Jay Rock, overlooked vet Royce Da 5'9" and weirdo newcomer Tierra Whack. In that world, Drake is still a streaming king, despite being recently (and, in all likelihood, briefly) dethroned by J Balvin as the world's most played artist on Spotify. He's never been a true album artist; not even his best LP — argue amongst yourselves, please — is as cohesive as his so-called mixtape If You're Reading This It's Too Late. No matter how seriously he may take himself as an MC, no credible student of hip-hop would rank him among the genre's all-time best. He's a lyricist, not a rapper's rapper; a vocalist, never a singer's singer. Yet he's a star unlike the genre has ever known. You have to go back to LL Cool J or Big Daddy Kane to find a male rapper so willing to overtly cater to the ladies, and even those legends lost their grip on the men whenever they overplayed that hand. Drake's truest predecessor, Phonte (Little Brother, The Foreign Exchange) released an album this year that will easily be among the critical faves, but won't get radio spins or a RapCaviar placement. Instead, Drake is the last crossover artist in a black music genre that took over the mainstream by thumbing its nose at the concept. Ever since Rick Ross survived being unmasked as a former correctional officer, the keep-it-real genre has been adjusting its relationship with authenticity. In a universe where Miami's biggest kilo pusher on record was a former turnkey in reality, it's easier to grasp how Drake got his ghostwriting card pulled in 2015 and lived to tell the tale. But control is central to his approach — and until Pusha T got the better of him a month ago, the man who made it cool for rappers to wear their hearts on their sleeves had never been put in such a truly vulnerable position. His sole direct response was the social media equivalent of a press release, attempting to explain away the blackface photos unearthed when "The Story of Adidon" dropped. The only other words came from Drake's industry godfather, Rap-A-Lot founder J. Prince, who claims in interviews to have called Drake off — an old playground trick seemingly deployed to help him save face. Or it could prove to have been an elaborate head fake. What's at stake this time is not authenticity, but credibility. Long considered touchstones of the culture, beef and battle rap are also products of hip-hop's hypermasculinity. Drake could counteract all of that with an honest R&B ditty confronting his exposed wounds on record — his alleged secret son, his parents, the roots of his familial disunity. It would be such an on-brand thing to do. Not only would he win the battle on his own terms, he'd relieve himself of the one trait that's always been his Achilles heel — the aching desire for acceptance. The running joke on Twitter right now goes, "Biggie released a double album after he died, too." Drake's rise to the top of the industry food chain has never stopped him from being a punchline. But likening his defeat this spring to career death may be premature, considering how often he enjoys the last laugh. If he's saving his stinging reply for Scorpion, it could be the vital exception to a season full of major releases that amounted to nonessential listening. Or he could join the greats before him, who have attempted to make vagueness the new vogue in this era of post-authenticity. In the end, his pop appeal will continue to thrive. But for an artist who has always worn success well, risking it all by wearing this failure on his sleeve could be the most authentic move of his entire career.